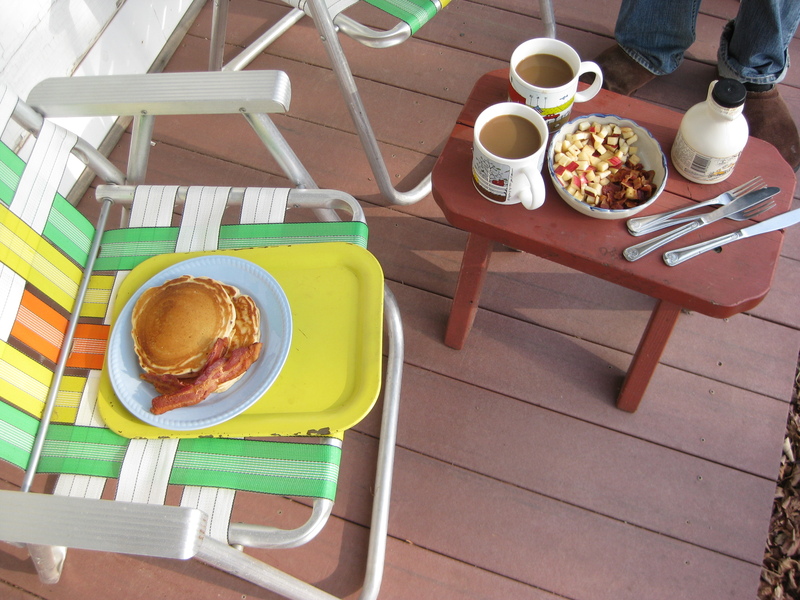 What could be better than a pancake and bacon breakfast on the porch? Not much, I promise, not much. MIX IT UP: Ya, ya I know. Pancakes made from scratch are great. But you know what? Some of the ones that come from boxes taste pretty darn good too. And when I’m in a farmhouse that isn’t as always well stocked as my own home and the closest store is a trek, you can’t beat a pre-made pancake mix. Our favorites are New Hope Mills Buttermilk Pancake Mix and Kodiak Cakes Whole Wheat, Oat and Honey Flapjacks. ADD YOUR OWN SPIN: Intensify the flavor of your pancakes by adding a teaspoon of vanilla extract (check out our easy homemade version here) and a tablespoon or more of maple syrup to the batter. Occasionally I like to throw in a dash or two or ground cinnamon or ground ginger as well. USE SOMETHING UNEXPECTED: Our go-tos are pieces of cooked bacon, diced apple and chocolate chips. Sometimes we even use a combination of them all! Fresh fruit, shredded sharp cheese—the possibilities are endless. SERVE A SAVORY SIDE: Balance the sweet flavor of the pancakes with some sausage or bacon strips. We’re big fans of the options available at Hull-O Farms. TURN UP THE HEAT: Serving a bit of warmed syrup on the side makes this breakfast feel extra indulgent. I know what we’ll be doing this weekend! Perhaps you should too. After all, I bet that special guy in your life (hi dad, sorry I won’t be celebrating with you in person this year) deserves a lovely breakfast in bed (or on the porch) this Sunday. SWWU Tip: Pancakes with toppings cooked into them often result in a sunken-hole look. Avoid this by putting a bit of batter on top of each pancake after you’ve sprinkled on your topping of choice and before you’ve flipped it over. The pancakes in the photo above have apple and bacon pieces cooked into them, but they still look picture-perfect! This entry was posted in In the Kitchen, On the Farm and tagged @SWWUblog, bacon, breakfast, breakfast in bed, chocolate, father's day, flapjack, in the kitchen, kodiak cakes, maple syrup, new home mills, On the Farm, pancake, pancake mix, vanilla extract by Something We Whipped Up. Bookmark the permalink. We also add a teaspoon or so of fiber to our pancake mix to give us a healthy boost without knowing it’s even there!